It is fascinating to see Jewish heritage in a deeply religious Muslim country. Tunisia is one of the world’s most ancient Jewish communities, dating its arrival from 586 BCE. Over the centuries, (~ 2,300 years) the Jews have lived under the Romans, the Spaniards, the Turks, the Arabs, and the French colonizers. 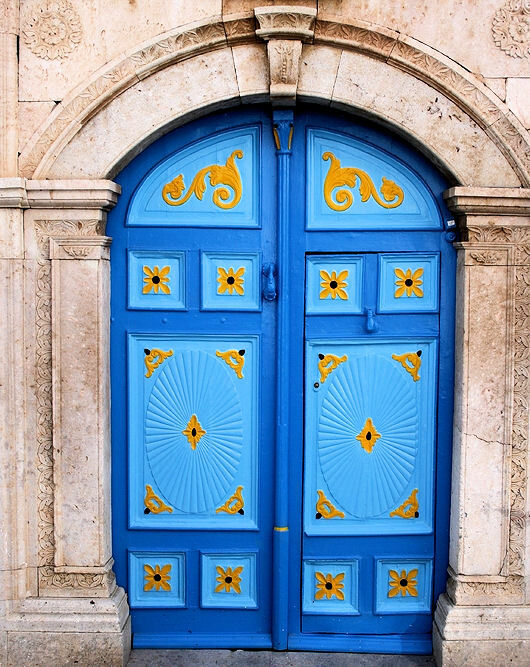 At la Goulette, visit the Jewish Elder center and Synagogue. Transfer to the Great Synagogue in Tunis. Transfer to the Medina (~ 5km, 15mn drive, the heart of historic Tunis) one of the best preserved Islamic cities in the world. Walk through the meandering streets, viewing the architecture of some residential quarter, as well as the activity and excitement of the souk. Also see the great Mosque of Djamaa-ez-Zitouna, walking through Souk Echaouchia (Traditional cap makers market) and Souk El Attarine (Perfume market). The visit starts at Byrsa Hill with an introduction to the Tunisian history and the story of foundation of Carthage, followed by a visit of Punic Habitations and Carthage National Museum. Continue (5mn drive) for a brief visit of the Punic ports. Continue (5mn drive) for a brief visit of the Anthonine Baths. Perched high atop of a cliff overlooking the Mediterranean, this picturesque village is a delightful place for a leisurely stroll through winding cobbled streets. Its trademark white walls, contrasting sky blue doors and ornate window grids make for wonderfully inspiring setting. Wander around the boutiques for souvenirs or relax at a cliff-side Moorish café.